While most children are gearing up to go back to school, the majority of children in Liberia cannot, simply because they can’t afford a school uniform. Thankfully NBA star Shaquille O'Neal and fashion designer Whitney Port have teamed up with UNIFORM to help send thousands of children back to school! UNIFORM is a premium T-shirt line that puts an innovative twist on the traditional 1 for 1 model by creating jobs and donating a school uniform with every T-shirt purchase to a child in Liberia who otherwise could not attend school. UNIFORM’s recent Kickstarter campaign raised over $230,000 and put over 8,000 children back in school! 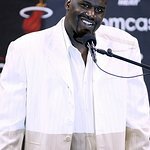 The brand’s unique efforts moved Shaq to ‘get back in UNIFORM’ to spread the word as an ambassador for this empowering campaign. Whitney Port is also ‘getting in UNIFORM’ by designing a graphic muscle tank for women as a collaboration with her line Whitney Eve.